Pretty normal morning so far. OH right, last night I had to find Wisp. I hoped he was going to be right by my house like last time, but no. 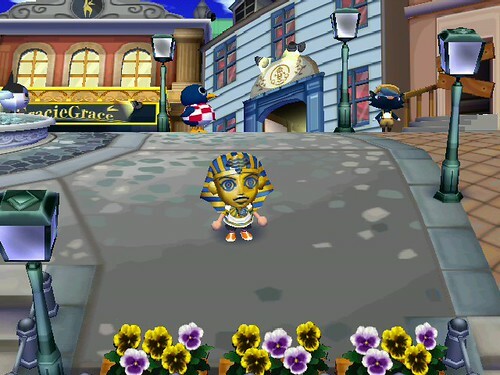 I searched all over town, and he didn’t turn up until I was in the north-east area of town. He was hiding by one of the little ponds near the river. I was nervous about what to ask for, since I know he doesn’t always give you such useful objects. I decided to go with a hat, and he gave me a 1-Up hat, which is great cuz I didn’t have it! So WOO thanks Wisp! Anyway, my Ancient Room is pretty much done. I think it looks cool! Maybe someone can give me some pointers? Come visit and check it out people! Hmm… (What’s wrong?) Ohh, Squirt… Ever since I told you about my sister, I’ve had so much on my mind, Squirt. 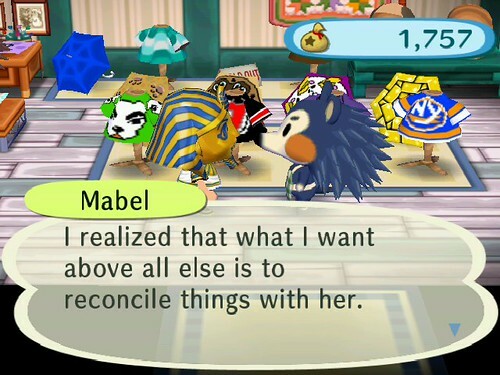 I realized that what I want above all else is to reconcile things with her. I think I finally understand where both my sisters were coming from when that big fight happened… Label was always talking about how she wanted to go live in the city. Sable kept saying she wouldn’t let her go, no matter what. And I was so young then… I still didn’t understand what was going on… But now, when I think about it from their perspectives, I feel so conflicted about it… Ohhh, sorry about that. I know that story is a bit of a bummer. And there’s nothing that can really be done about it now, so I should probably just drop it, right? Anyway, back to work, back to work! Don’t drop it Mabel! Ohhh well. Is this the end of the saga? Or is it endless banter with no real action of anyone doing anything about it? I dunno. 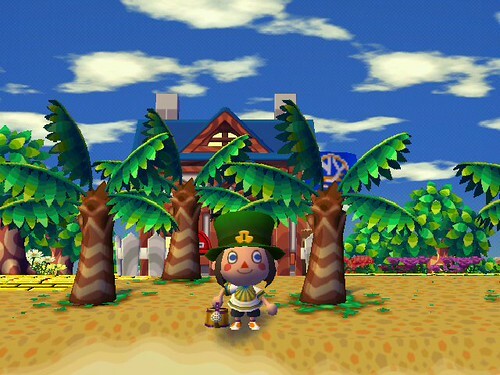 Imagine my surprise when I logged in again later, only to find Pete standing outside my house! And he had a special delivery letter for me from Nintendo! Can it be, the first DLC to be released in America for this game? Indeed! 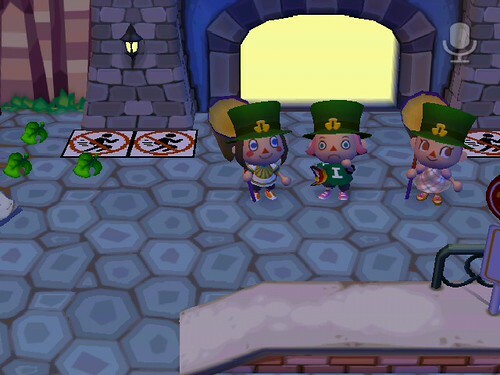 A Shamrock Hat was attached to the letter, which I quickly put on and started wearing it around town. I’ll have to log into my other characters so I can get some spares. I think word must have gotten out about the new DLC, because lots of people were on WFC! Doomdoom’s gates were open and I popped in to say hello! Vella’s friend Antonio also came by, in a chef’s outfit. Very nice. 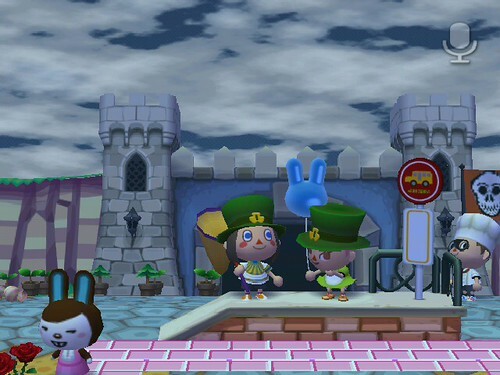 He hadn’t gotten his new hat yet, sadly, so he had to wait in the background while we took a photo at the bus stop lol! Vella is looking like a Leprechaun lol! We cloned Sahara carpets for a while since the opportunity was there, and I got a bunch of new wallpapers! Too bad most of them don’t match the new carpets I got the other day lol! I’ll post a list or something tomorrow if I remember. I wanted Vella to see my new Tomb Room (or so I am now calling it). An unexpected visitor showed up – Bam Bam! 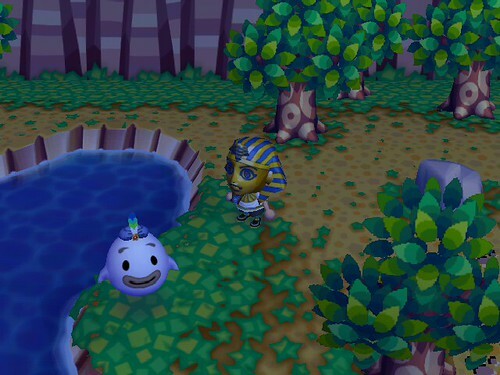 He finally got his friend codes in line and found my open gate! 😛 He had already received his Shamrock Hat, so of course it was photo-op time once again! 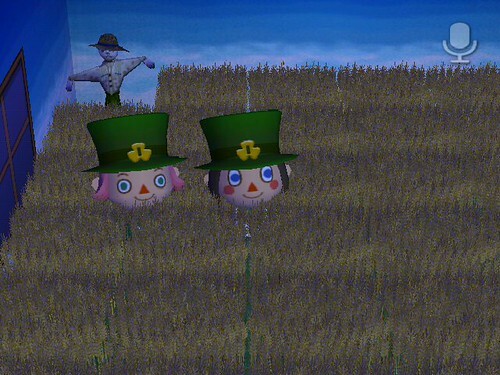 Three Shamrocks in a row! After Vella had to go, I decided to pop on over to Plaahaus (I hope I spelled it right, it’s pronounced Playhouse lol). I got the grand tour, and checked out all the cool furnishings in everyone’s house. My favorite was the wheat field room – I had never really seen this item in a room before, and I didn’t know you could run through it. I thought it was so fun! You can only see our heads. Bam Bam and Squirt heads! And one last tidbit… I logged in to the other characters in Shaolin so they could get extra Shamrock Hats for me. Deb likes to talk to the townies when she’s walking around, especially Rowan since he was so nice to give Twinx a birthday cake. Deb’s birthday is next month, and she wants something good too lol! 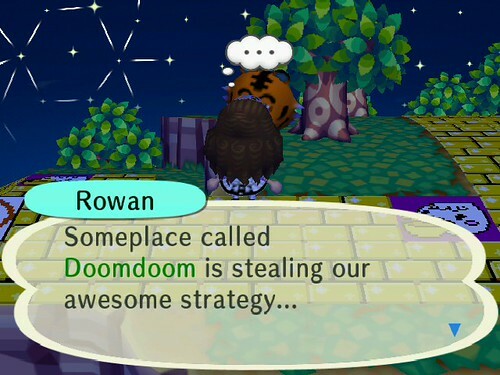 Rowan had something on his mind that I think needs to go out in the open. He said that a certain town was trying to steal Shaolin’s thunder. Hey Missy! Of course you can add me to your Blogroll. Post your URL here or email me so I can add yours to my blog as well! 🙂 And send me an FCR on ACC so I can add you to my friends list. Thanks for reading, and please comment whenever you want!